What do you get when you combine cobalt, nickel and scandium? If today’s ASX developer is anything to go by, you have a potent technology metals cocktail, one that’s ripe for the rapidly expanding electric vehicle and rechargeable battery markets. Cobalt and nickel play vital roles in the Tesla-fuelled electric vehicle-powered revolution. It’s something we go on a lot about here at Next Mining Boom. And the battery technology rally shows no sign of slowing down, with electric vehicle sales poised to grow from 1.2 million in 2015 to more than 20 million by 2020. While cobalt has been part of a long conversation this year, you may not be so familiar with scandium. Scandium is an in-demand, high-value but scarce metal used to produce aluminium alloys. It’s also being touted as a potential breakthrough metal, supplying the aircraft market, where it can be alloyed with aluminium to increase strength and corrosion-resistance. With the rapid movement towards cleaner, more sustainable energy sources, this company is seeking to supply critically needed technology metals. Commercially viable scandium deposits are rare , but annual scandium demand is anticipated to increase by at least 800% over the next decade. That means that today’s $29.9 million capped ASX company could be in the right place at the right time. Its goal is simple: to emerge as a leading supplier of these sought after commodities. It is doing this by developing two world-class cobalt, nickel, scandium projects in NSW and Queensland. And if it keeps up the sure-footed progress it’s managed so far in advancing these high-impact, already JORCed up projects, it has every chance of success. Although the company still has a long way to go to achieve its aims, thus investors should seek professional financial advice if considering this stock for their portfolio. The first slice of the technology metals pie in this company’s portfolio is the Sconi Cobalt-Nickel-Scandium Project in Queensland, one of the most advanced cobalt projects in Australia. This project is tracking on schedule, with mining and environmental approvals already in place. A Bankable Feasability Study (BFS) is currently underway and set for completion in around April next year. The size of the tenement is also set to increase ten-fold, with additional exploration applications in the works. This could also expand the existing Mineral Resource in the coming months. The other half of the renewables puzzle is the company’s Flemington Cobalt-Scandium-Nickel Project in Sydney, which is considered to be the western continuation of Clean TeQ’s Holdings (ASX:CLQ) Syerston deposit. Syerston is one of the largest and highest grade undeveloped nickel and cobalt resources outside Africa and contains the world’s largest, highest grade scandium resource. Today’s ASX developer has in its hands what is regarded as the other half of that deposit. The company recently completed a resource extension drilling program at the Flemington property, targeting an increase in overall tonnage, as well as a maiden cobalt Resource. Final assay results are expected in September, a matter of weeks away. Both Sconi and Flemington are projected to have mine lives of at least 20 years and the potential to provide 95% of the raw materials used in emerging battery technologies. To top things off, construction of a demonstration-size cobalt, nickel and scandium processing plant in Perth is currently underway, set to be fully operational and processing bulk samples of ore from Sconi and Flemington in November this year. With interest from future offtake partners steadily building, driven by battery manufacturers’ concerns over whether current suppliers of raw battery metals can satisfy voracious demand, commissioning of the plant will enable the company to fast-track negotiations with both potential customers and project financiers. As the company transitions from developer to producer, regular news flow is expected, including an updated scandium resource and maiden cobalt resource for Flemington... potential share price catalysts that could well pique investor antennae. This $36 million-capped company is in an excellent financial position to home in on this jam-packed course of action, with $4.6 million cash in the bank and no debt. But before we delve any further into the specifics, some introductions are in order. Australian Mines Ltd (ASX:AUZ) is an emerging developer with sustainable future technology metals on its mind. In AUZ’s arsenal is a triad of critical technology commodities: cobalt, nickel and scandium. We’ll look at these commodities in more detail shortly, but for now, let’s take a closer look at Sconi and Flemington. AUZ has a 75% interest in the Sconi Project via a joint venture with Metallica Minerals (ASX: MLM) . The project benefits from established surrounding infrastructure, which will provide ample support for future mine development. Sconi is considered to be the most advanced project of its kind in Australia, and reaps the rewards from being in one of the most stable mining jurisdictions in the world. That’s a considerable advantage which situates AUZ as an attractive supply chain partner for global manufacturers. 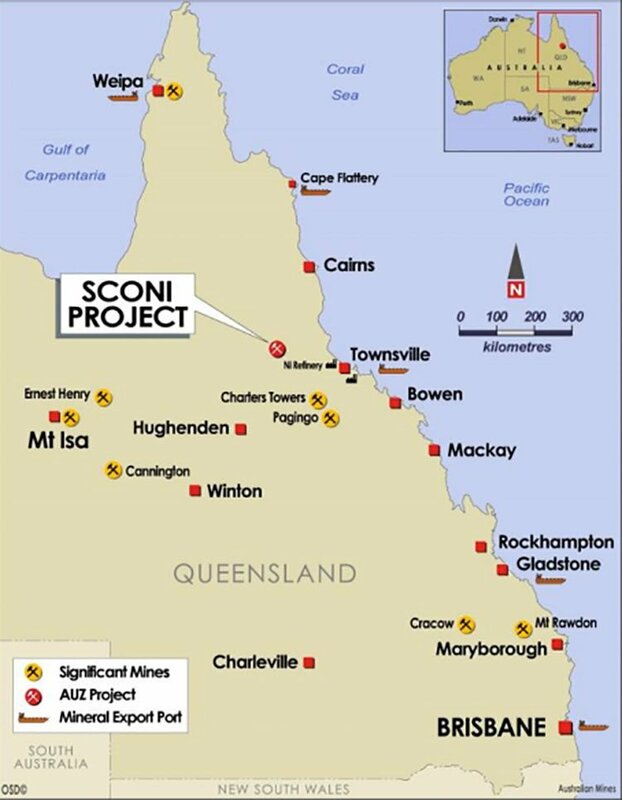 Sconi is similar to the $449.54 million-capped Clean TeQ’s Syerston Project in terms of in-situ resource size and grade, geology, metallurgy and expected metal recoveries. Everything here is ready to go: all relevant mining and environmental licences are in place to support the development of a mining and processing operation at Sconi. AUZ expects to announce a final investment decision in April 2018, a month after the scheduled release of its BFS, which is currently afoot. Sconi encompasses five deposits (two scandium-cobalt rich, and three nickel-cobalt), with a total scandium resource of 12 million tonnes at 162 part per million scandium for 2,989 tonnes of scandium oxide. The combined nickel and cobalt mineral resource for Sconi is 89 million tonnes at 0.58% nickel and 0.06% cobalt for 514,000 tonnes of contained nickel metal and 54,000 tonnes of contained cobalt metal. A Pre-Feasibility Study (PFS) recently completed on the scandium ore body confirmed the project as economically and technically viable, capable of producing 50 tonnes of high purity scandium oxide per year over a 20-year mine life, and generating an average EBITDA of $59 million per annum. A mining operation at Sconi has the potential to emerge as the world’s largest source of this critical metal from a primary scandium deposit. The purpose of the current BFS, which is being completed by a leading international mine consulting firm, is to assess the feasibility of a number of scenarios for any future operations at Sconi, including much higher production of cobalt and nickel than was previously considered in the PFS and scoping study. The Sconi footprint is also set to increase ten-fold with AUZ’s application for five new exploration licences . This expanded area is highly prospective for additional cobalt-nickel-scandium mineralisation, and will provide AUZ with operational flexibility around the existing mining leases, as well as potentially significantly expanding Sconi’s Mineral Resource. The prognosis? With everything in place, Sconi is well on track to become one of the first cobalt-nickel-scandium mining operations commissioned in Australia. Of course it is still early stages here and investors should take a cautious approach to any investment decision made with regard to this stock. The Flemington Cobalt-Nickel-Scandium Project is located in central NSW, within 400 kilometres of Sydney. 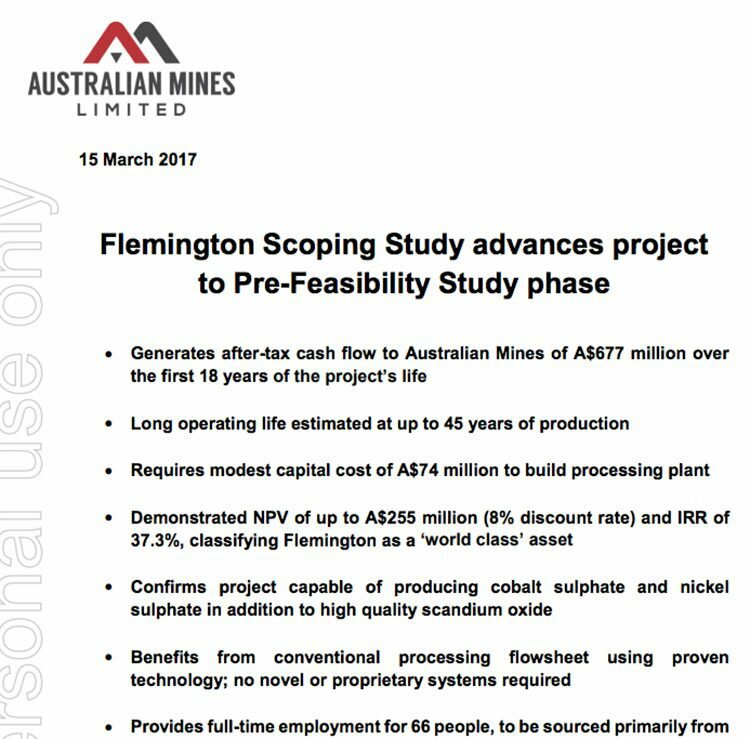 With its Flemington Project, AUZ has its hands on one of the highest grade scandium deposits in the world, with a Mineral Resource of 3.14 million tonnes at 434 parts per million scandium, including 2.67 million tonnes at 435 parts per million scandium in the measured resource category. There is also high grade cobalt mineralisation, with intersections including: 14 metres at 0.21% cobalt from six metres, and nine metres at 0.21% cobalt from ten metres. During the last quarter, AUZ completed a 239-hole resource extension drilling program at Flemington. 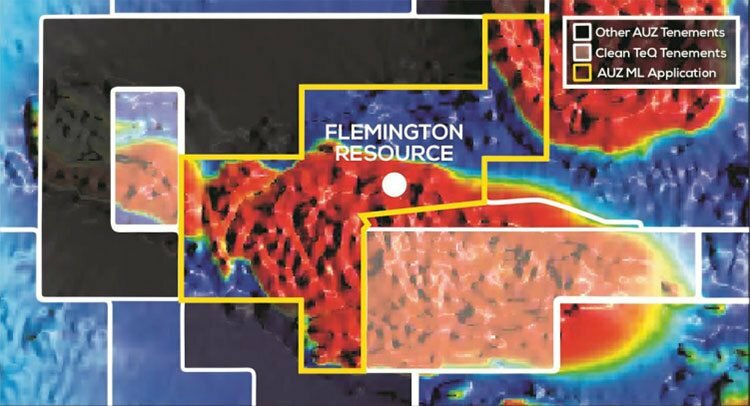 As AUZ revealed in early August , resource drilling has doubled the previous cobalt mineralisation footprint at Flemington. The scandium footprint is now also three times larger following drilling, with thick, high-grade scandium mineralisation confirmed to outcrop across the project area. The latest drilling comes on the back of a positive scoping study which found high-grade cobalt mineralisation continues beyond the current Mineral Resource estimate for the Flemington ore body – the same mineralisation that supports Clean TeQ’s Syerston project. The scoping study indicates a long operating life, with up to 45 years of production, suggesting that the operation will generate net cash flow of A$677 million over the first 18 years of the project’s life. The Flemington ore is also well-suited to a conventional processing flowsheet using tried and testing technology — no novel or proprietary systems required, which will reduce costs. 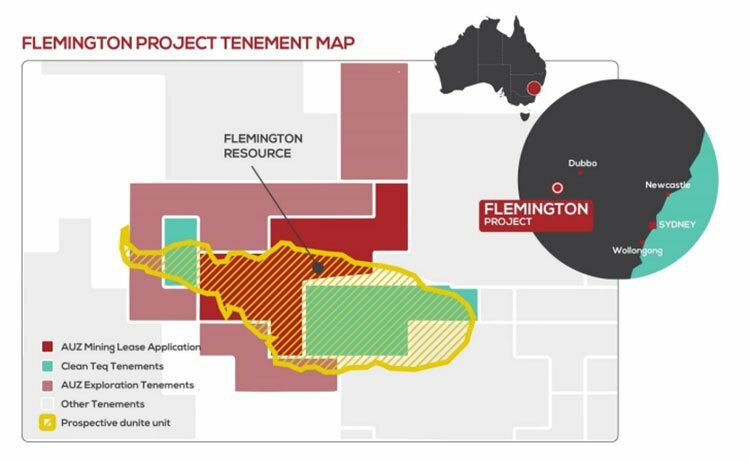 Flemington is expected to be a hub of activity in the coming months, with AUZ planning to target a Mineral Resource update in September. It expects to move straight to a PFS in the same month, which should be completed by April next year. Meanwhile, construction of a demonstration-size processing plant in Perth in the works, placing AUZ firmly on schedule to deliver commercial grade cobalt sulphate, nickel sulphate and scandium oxide products to potential offtake customers in November this year. Construction of the plant began in May , with the fabrication and build time estimated at six months. The plant uses a conventional pressure acid leach (PAL) front end to dissolve the metals into solution with a solid-liquid separation and standard solvent extraction (SX) and sulphate crystallisation back end to separate out the cobalt, nickel and scandium to produce final products. The short build time owes largely to the fact that AUZ is using standard, readily available processing equipment sourced from dedicated plant suppliers. With a throughput capacity of 2,200 kilograms per day, the plant is capable of processing more than 15 tonnes of ore per week, and delivering 67 kilograms of cobalt sulphate, 500 kilograms of nickel sulphate and 8 kilograms of scandium oxide per week from Sconi and Flemington. 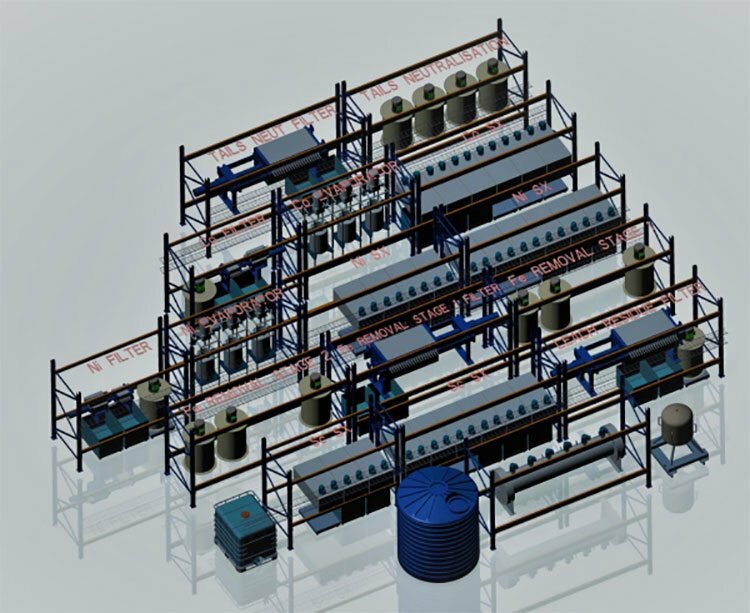 This demonstration-size processing plant has been designed in such a way as to be readily scalable to a full-size plant. This enables AUZ to optimise the processing flow chart and metal recoveries at a smaller scale prior to the design and construction of a larger commercial-scale plant, which is currently proposed to be built at Sconi. Commissioning of the plant later this year will place AUZ in an excellent position to strengthen its engagement with potential offtake partners in the battery and cobalt trading sectors. The shipping of bulk samples of cobalt sulphate and nickel sulphate to potential customers will also drive home certainty around expected product quality. In addition to cobalt sulphate and nickel sulphate, the plant will produce bulk samples of scandium oxide for a European auto-manufacturer and other parties interested in producing high-strength weldable aluminium. Production of commercial grade cobalt, nickel and scandium products will be essential in expediting ongoing negotiations with potential customers across Europe, Asia and the Middle East. The burgeoning battery technology industry is only picking up speed, which backs AUZ’s decision to focus on critical technology metals. 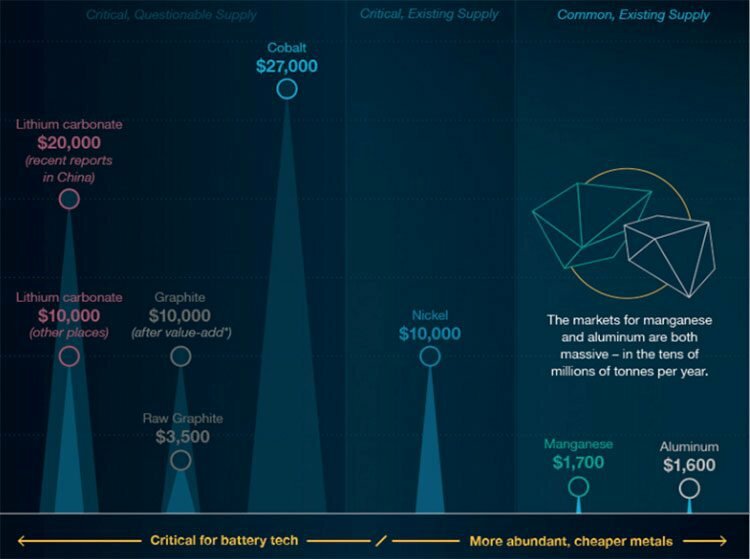 While it’s clear that the battery market is on a protracted high, crystallising strong demand, supply is less certain, especially as far as cobalt goes. 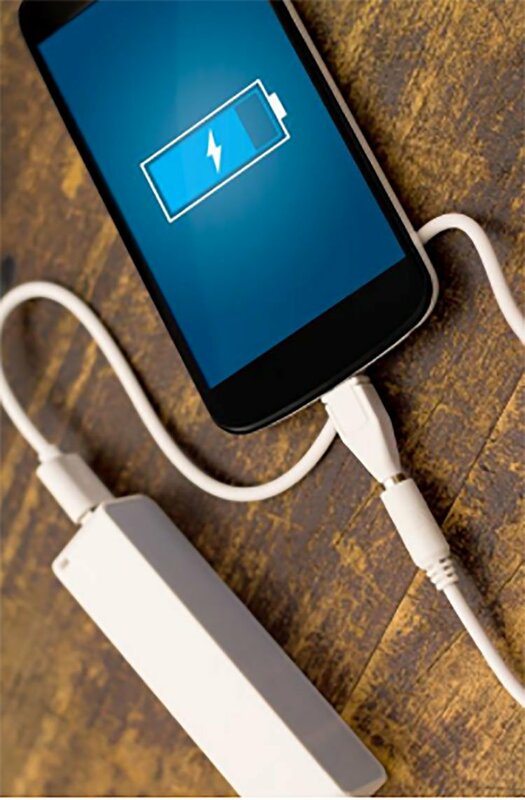 Some of the most critical battery metals have questionable or unstable current supply. As we transition into an electric vehicle-powered society, Tesla’s CTO, JB Straubel, has expressed more concern about the availability and future supply of cobalt than the supply of lithium. Cobalt supply is more problematic since the bulk has historically come from the conflict-riddled Democratic Republic of Congo (DRC). This is the biggest obstacle to boost cobalt supply. More than 60% of the world’s reserves are in the DRC, but there are serious concerns about how cobalt is mined there. In fact, Apple has said that it has stopped buying cobalt mined by hand in DRC until working conditions are resolved. In this vein, a plethora of legal requirements are laid out for all American companies, including Tesla, Apple, General Motors and The Linde Group, to annually declare that their supply chains are compliant with US and international laws and regulations around human rights, labour standards and environmental protection. The United Nations and the OECD have also set down guidance on sourcing minerals from conflict areas. Given this volatile situation, Australian cobalt production takes on considerable appeal, with negligible sovereign risk and low conflict, offering a transparent supply chain for customers. So, as manufacturers move to more ethical and stable cobalt sourcing, AUZ is nicely positioned to capitalise on the rapidly expanding electric vehicle market. 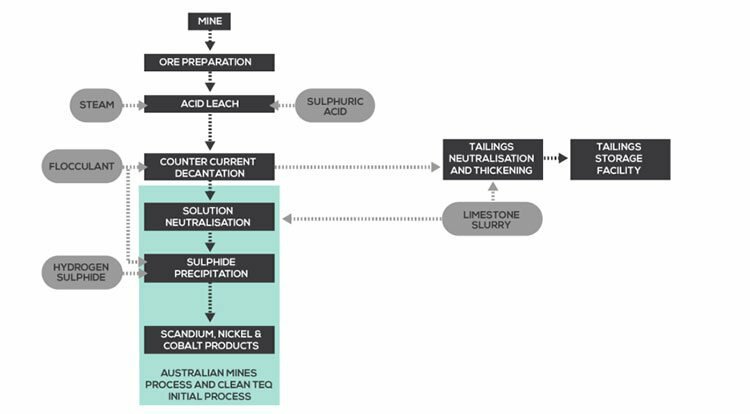 Test work confirms that Sconi and Flemington’s outcropping lateritic mineralisation can produce the cobalt sulphate and nickel sulphate products needed by the electric vehicle market, as well as a premium scandium oxide product that is subject to increasing demand from automotive and aerospace manufacturers (more on that in a moment). It’s also worth pointing out that Sconi is practically a walking battery itself. 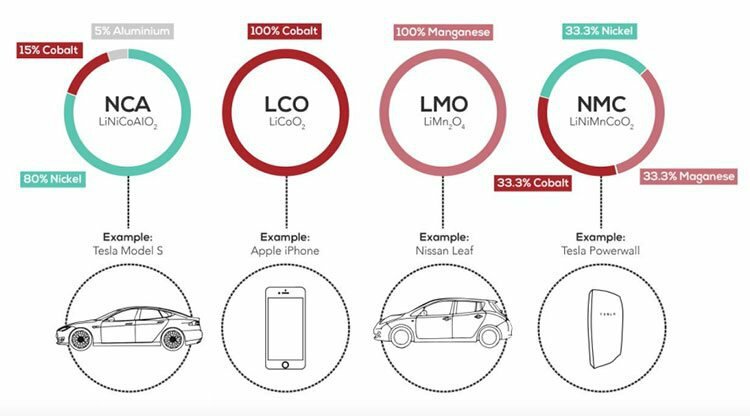 Sconi has the potential to produce the commodities that constitute 95% of the raw materials, with the exception of aluminium, in a Tesla Model S battery pack cathode (80% nickel, 15% cobalt) and 100% of the iPhone battery cathode, made exclusively from cobalt. Despite scandium’s scarcity and high cost, interest in the metal is rising, with annual scandium demand poised to increase at least 800% over the next decade as multiple high-value commercial uses have been developed. Of particular interest is the alloy of scandium into aluminium metal products. When scandium is used in combination with other common aluminium alloys, it can improve strength and heat tolerance, promote corrosion resistance, and extend weldability. Existing demand for scandium expands across multiple civilian and military applications, including automotive and aircraft manufacturing, solid oxide fuel cells, and lightweight, high-strength sporting equipment. The single largest market sector use for aluminium is transportation, primarily aircraft and automotive. Aluminium products are increasingly incorporated into these applications to meet fuel efficiency requirements. 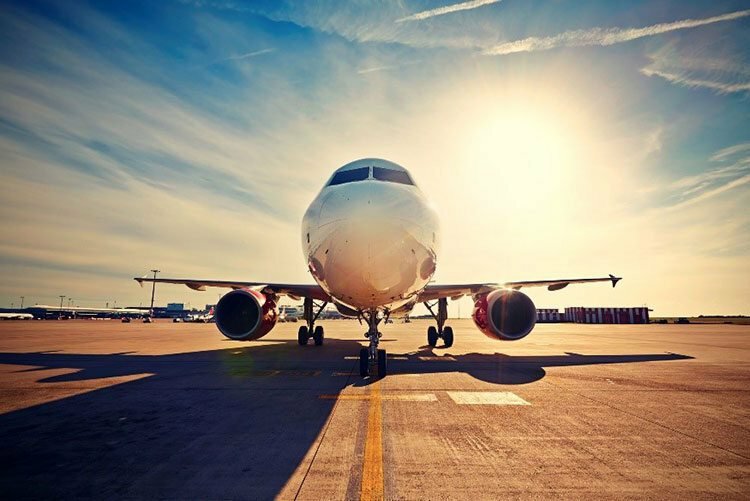 Aircraft designers are of the belief that use of Al-Sc alloys can reduce aircraft weights by 15%-20%, and the ability to employ weldable structures promises similar cost reduction potential. However, manufacturers have never been able to get hold of sufficient scandium supplies. Worldwide production is estimated at just 20 tonnes per year, with the majority coming as by-products from Russian and Chinese mines. There are only a handful of advanced emerging primary scandium producers in the world and they all have projects in Australia that are geologically similar, in that the scandium is hosted in laterites. Bearing in mind that Sconi is one of the most advanced cobalt projects in Australia, with strong potential to emerge as the world’s largest source of this critical metal. This could mean serious business indeed for AUZ. If AUZ gets commercial production up and running, it could stand to become a major supplier. Of course it is some way off achieving this aim and thus investors should take all publicly available information into account and a cautious approach to any investment decision with regard to AUZ. AUZ is also working collaboratively with an established European company to develop a cost-effective, high-quality aluminium-scandium alloy for potential use in high-end sports cars and luxury motor vehicles. AUZ is now set to make the steady transition from developer to producer, and could quickly emerge as a force to be reckoned with. With $4.6 million cash and no debt on its books, AUZ is in a fighting financial position to embark upon this cluster of activities. With a host of milestones coming up in both the near term and into the next year, we expect the road ahead for this ASX developer to be signposted with regular news flow. 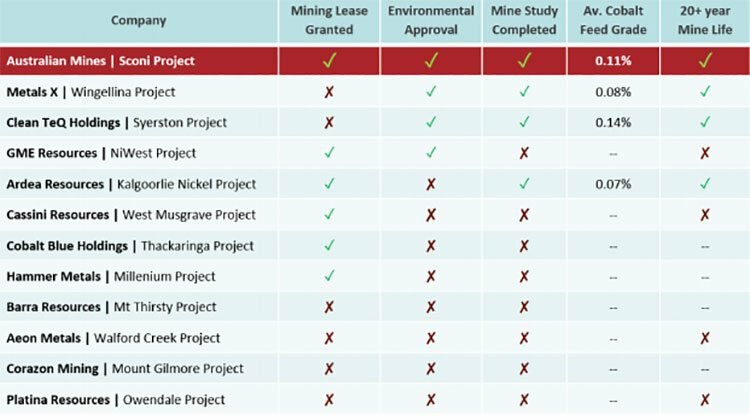 Attaining any of these milestones could see a significant share price re-rating for the $36 million capped AUZ. We’ll be sure to keep you in the know as news flows in over the coming weeks and months.